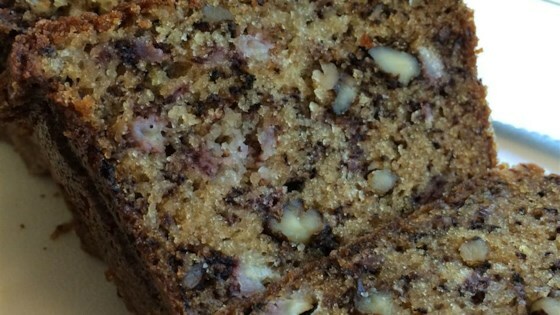 "This is my mom's dense, excellent, and definitely unhealthy banana nut bread recipe. It's always completely gone in minutes. This is great at parties, but hazardous at home. HEALTH WARNINGS: EBNB may be habit forming. A very flexible recipe that will accommodate changes based on what you have on hand. Use any type of fat in place of the butter, such as shortening or oil. It works with either brown or white sugar too." This banana bread is flavorful, moist, and addictive. I have made this recipe twice. For some reason it does not rise right. The taste is perfect.my baking soda is fresh so I can't figure out what is wrong. Is anyone else having this problem? Wonderful recipe! I, too, added 1 tsp cinnamon, 1 tsp vanilla, and an extra 1/2 cup of walnuts. I also split the sugars between white and brown. This made 3 8x3" loaves (baked for 1 hour).